Hunawihr is a small village with just two streets. 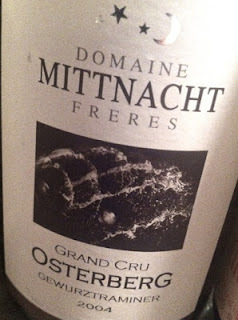 But there are some producers you absolutely can not miss: Mader (with its dry rich style), Sipp-Mack (on the way back after the painful split in the Sipp-Mack and Agapé), the cooperative (which never makes you disappointed) and the discrete but absolutely fabulous Mittnacht Frères. The firm is located on the main street, opposite François Schwach and David Ermel, and is run by cousins ​​Marc and Christophe. Here are all the wines very, very high quality. 2004 Gewurztraminer Grand Cru Osterberg from Mittnacht Frères in Hunawhir is golden yellow. 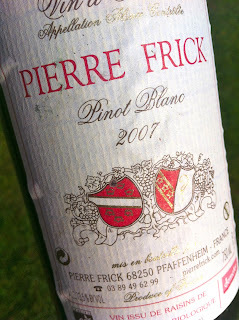 The nose is fresh and tight with hints of ginger, peach, smoke, grapefruit and wet stone. 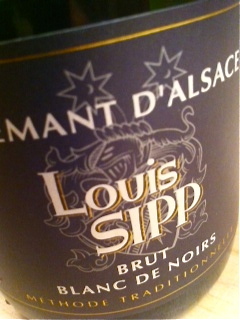 The taste is complex with creamy fruit, firm acids and a honey-like sweetness that leads into a long, balanced finish. Yezzz! Price: 18 €. 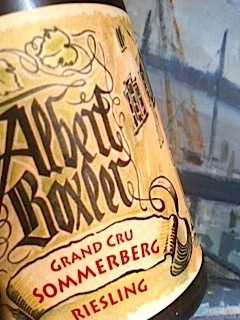 Grand Cru Osterberg provides some of Alsace freshest wines, regardless of grape. 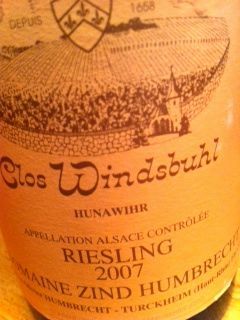 Often you'll find firm acids of lime and lemon in the Rieslings, and even Gewurztraminer from Osterberg is tight and elegant despite much residual sugar. The character comes because Osterberg slopes slightly to the east rather than to the south, while the heavy and calcareous marl soils keep protects the acids during the ripening process. 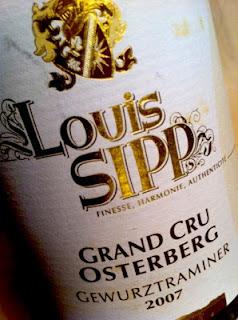 2007 Gewurztraminer Grand Cru Osterberg from Louis Sipp in Ribeauvillé is green shimmering in golden yellow. The scent is fresh and it has exciting aromas of cured ham, lavender, honey and grated ginger. The taste is very mellow with a velvety mouth feel, and tight and almost harsh acid that provide energy to balance a natural sweetness. The aftertaste has a lot of salinity, a trait that will become more and more prominent with age. Price: 20 €. 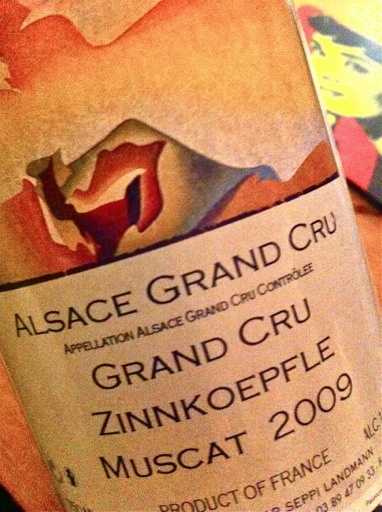 Alsace wine producers will remember 2012 as one of the most stressful vintage in the last times! We had all the climate extremes we could imagine : some winter frost, much rain in summer, hail... We had to be very vigilant all year long and adapt our strategy to the climate. The sunny and dry weather in August and early September saved us. This permitted to dry the leaves and the grapes, and thus to avoid the rotting of the grapes. The grapes ripened very fast, permitting to start the grape picking earlier than expected. Then the weather forecasts predicted a long rainy period, and we realized that we had to pick the grapes as fast as possible, knowing that the grapes were perfectly ripe and that there was a risk of dilution and rotting. 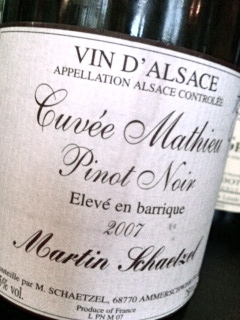 We started with the Pinot Noir and Pinot Gris, which are really great: very healthy and a nice balance in the wines. 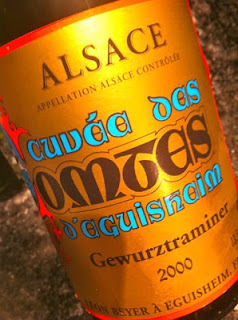 Then the Gewurztraminers were very aromatic and balanced too. We picked all our vineyards because we realized that there was no chance to produce any good late harvests this year, which turned to be a good choice. 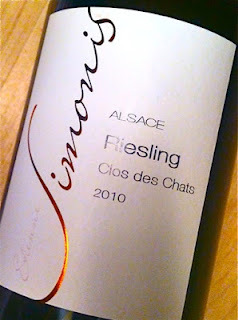 Finally we picked the Rieslings last, which had more difficulty to ripen due to the draught. The best vineyards with low yields and deep roots managed to ripen before the rains, the others will be a bit lighter this year. However, the result is much better than what we expected during the summer! 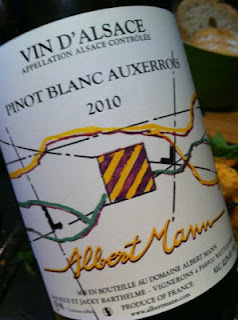 In my opinion and in my region of Alsace, Pinot Noirs and Pinot Gris will be the best varieties this year, some Riesling and the late harvests won't be as good as in the last years. 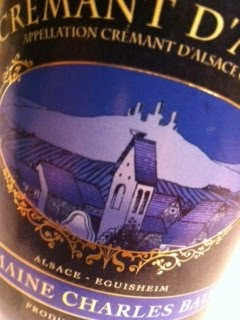 Actually, it is inconceivable that they have managed to build a golf course in the hills of Alsace. It lies in the valley that extends to the southwest from Ammerschwihr. At the height of the first tee, but on the opposite side of the valley lies the protected, magnificent vineyard Katzenstegel. Here the bedrock is composed of granite, covered by a thin layer of sun-baked sand. 2010 Riesling Clos des Chats from Réne Simonis in Ammershwihr is deep yellow. 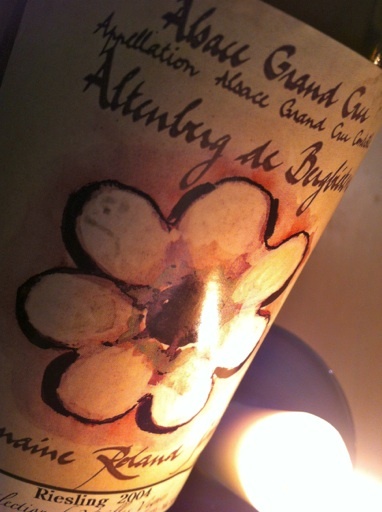 The scent is, despite the vintage, very generous with pineapple, passion fruit, orange and lilac. 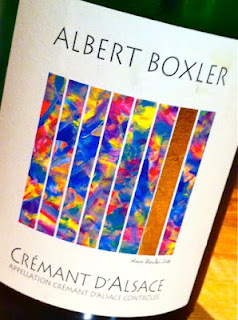 The taste is powerful and bursting, full of delightfully chewy fruit, framed by good acids, while the finish is so clean. Bottled sunshine. Price: € 10.50. Seppi Landmann is a producer with a passion for wine and wine as a carrier of culture. Not only does he have plantings of Muscat on his best terroir, for the harvest in the weekends he invites friends, auto workers from Toulouse, Swedish wine tourists and others who want to spend a pleasant but tiring day on the steep and sunny slopes of Zinnkoepflé. For lunch soup, rich stories and laughter are served. 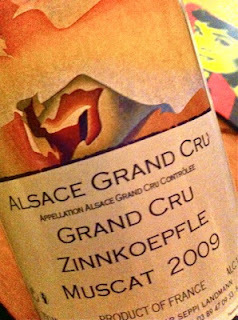 2009 Muscat Grand Cru Zinnkoepflé from Seppi Landmann in Soulzmatt has a bright golden yellow color. 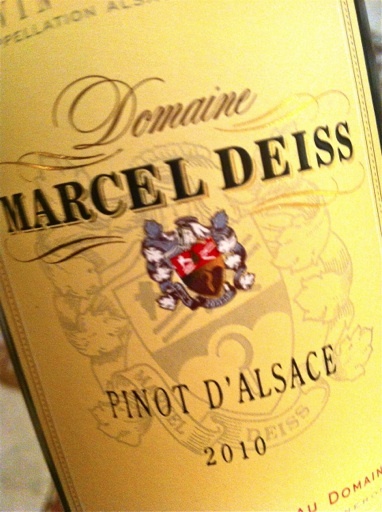 The aroma is rich and composed of orange, melon, almond and white flowers. The flavor is wonderfully elegant, complex and dry with layers of fruit and lively acids in a featherweight body. 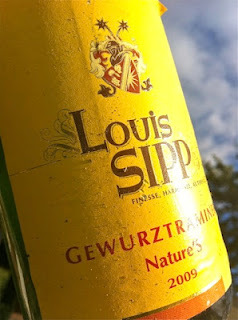 A wine full of character that illustrates Seppis great skill and delicate touch. Price: € 12 (au primeur). Léon Beyer has long nourished the image as the winehouse that makes the driest of all dry wines in Alsace. Thus, it was feared that the firm's basis Riesling from a year of extremely high acid levels would be backward and sour. However, concern is not justified. 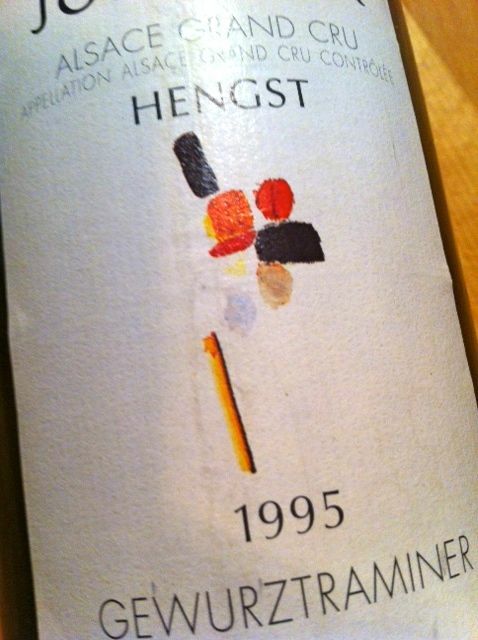 This shows that 1) Beyer have skilled providers of grapes, 2) not even Beyer allows the dryness go to extremes and that 3) Léon Beyer is a producer you can trust. 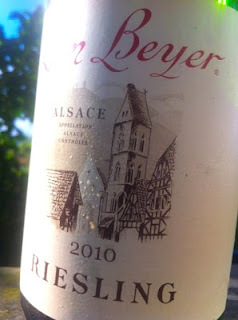 2010 Riesling from Léon Beyer in Eguisheim has a generous aroma of oyster shells, cooked apples, ripe lime and green herbs. The taste is quite light, but the charming and youthful fills the mouth well while the acids ase fresh and clean and just a hint malic. A very positive acquaintance! Price: €11.50. 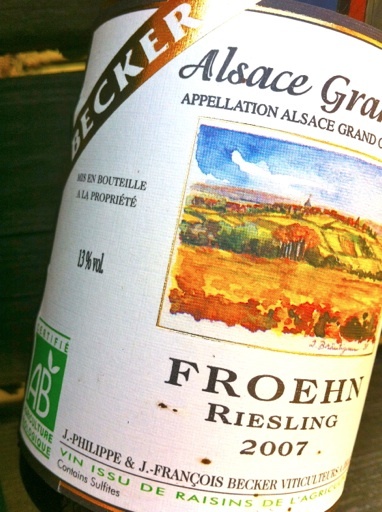 Grand Cru Froehn covers some 14 hectares, and with an average yield of 50 hectoliters per hectare, it should - given that a sizable portion of wine from a Grand Cru is not sold as Grand Cru - be made ​​about 60 000 bottles of Grand Cru Froehn. Who makes them? 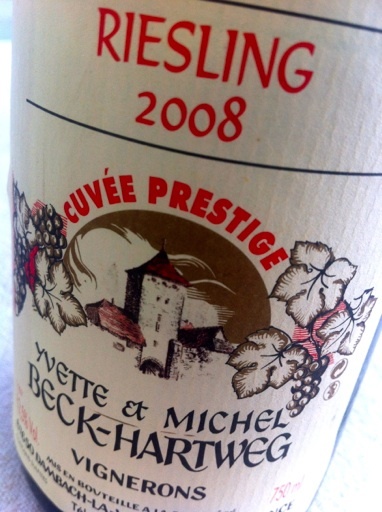 There are only six Vignerons Independants that make Grand Cru Froehn, as well as two cooperativ, Beblenheim and Hunawihr. Where do they go? 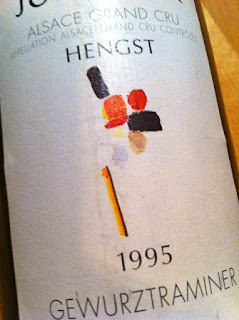 No, what Froehn needs are more producers that, just as Becker, emphasize and develop this terroir. 2007 Riesling Grand Cru Froehn from Becker in Zellenberg has an expressive and sweet smell that includes pineapple, milk chocolate and raspberries. 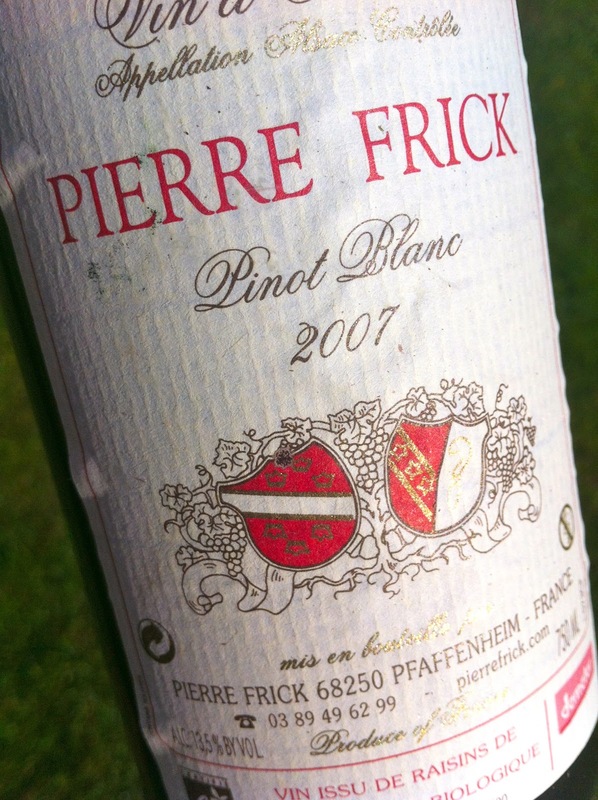 The taste is medium bodied and very dry with good intensity, acids leaning towards lemon and a fairly long finish. Very sympathetic! Price: € 12.80. 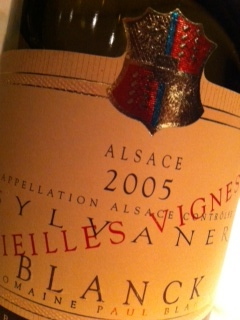 France has many acclaimed wines, and just too many who do not get the appreciation they deserve. This overlooked category includes many frech and mineral Muscadet, numerous Banyuls that is an excellent substitute for port wine, brilliant white Burgundies from Saint Aubin, healthy red Cabernet Franc wines from the Loire, and - not least - Sylvaner from Alsace. 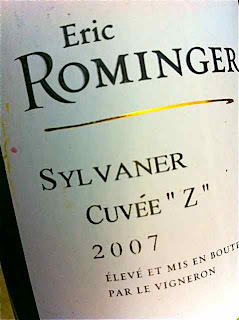 2007 Sylvaner Cuvée "Z", Eric Rominger in Westhalten has grown in Grand Cru "Zinnkoeplé. 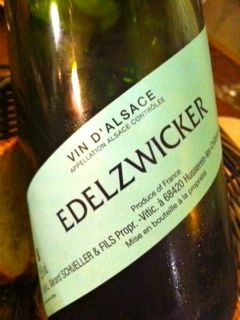 The scent is developed, toasty and mixed with melon, coriander seed and smoke. 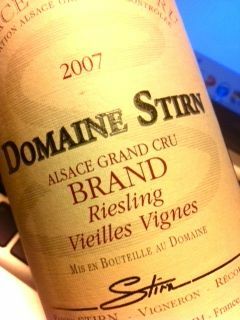 The taste is big and powerful, full of energy and with a lovely balance between the sturdy acids and the dense, slightly oily aftertaste that is completely dry. 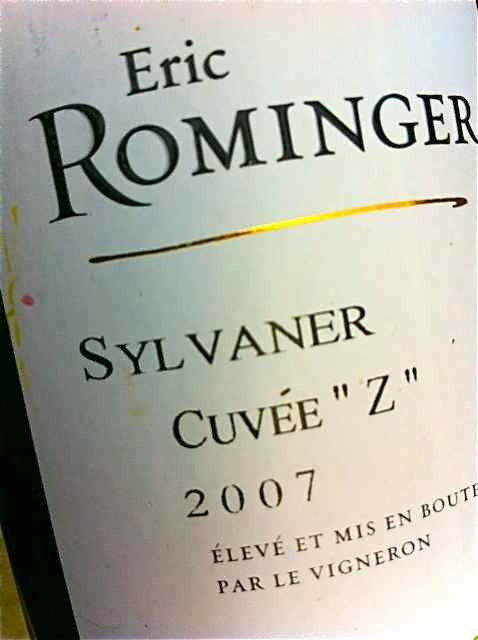 Just what a Sylvaner should be. Price: € 11. 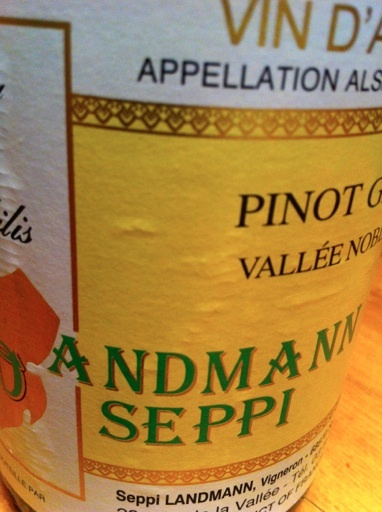 Seppi Landmann has for years welcomed pickers from all corners of the earth to participate in the harvest of grapes from Grand Cru Zinnkoepflé, lieu-dit Bollenberg and the beautiful valley Vallée Noble. 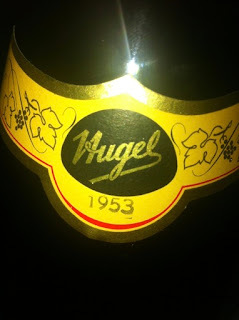 His late harvested vendanges tardives and sélecton de grains nobles have been legendary in character, depth and purity. But the years have passed and Seppi has now, in the absence of natural heirs, formed an alliance with Rieflé Rouffach to secure continuity.